his year’s Christmas Spectacular has a new finale number, and with that, a new costume! 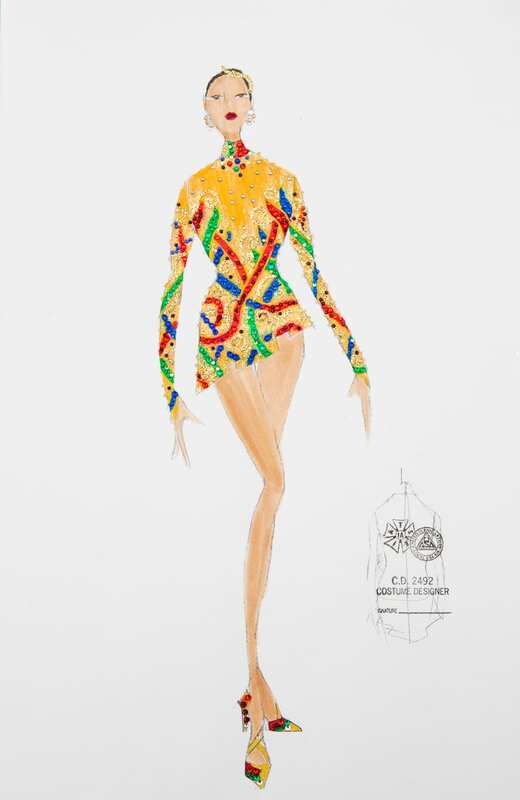 Designed by Tony and Drama Desk Award-nominated costume designer Emilio Sosa, these new designs are embroidered with a custom pattern in 11 shades of jewel-toned colors made up of 3,069 Swarovski crystals, as well as additional gold studs and sequins. During the ideation process of this new Rockettes look, Emilio was given artwork surrounding the new scene and looked to other key members of the Christmas Spectacular team for inspiration: “I get a feel from the choreographer and the director of what the look is, what’s the feeling, what do you want the audience to leave with? How can I incorporate that into the design? [The Rockettes] are dancers with amazing precision, so the costume has to account for that. The pattern is a nod to what Emilio calls the Christmas tradition of tangled strings of old lights and plugging in the bulbs to see which work and which don’t; it’s a “color explosion,” and that’s clear from the headpieces down to the custom LaDuca shoes. Our headpieces alone are adorned with 1,296 colorful rhinestones and our custom LaDuca shoes are painted to match our unique skin tones, with 572 hand-glued crystals to catch and reflect light on each pair. In addition to the new costumes, audiences will be ‘wowed’ by our new finale which will feature never-before-seen choreography, 100 Intel® Shooting Star™ Mini drones* flying above the stage, and state of the art digital projections from Obscura Digital. Don’t miss this year’s Christmas Spectacular at Radio City Music Hall—the show runs from November 9 until January 1.